This leaflet aims to provide practical advice on the high pruning of broadleaved trees. It does not deal with formative pruning of very young trees. This is covered by another leaflet. Forest trees lose side branches naturally over time as they become heavily shaded by higher branches. However, because the process is so slow, both live and dead branches leave knots in the wood that reduce the value of timber. Pruning is undertaken to accelerate the process of branch death with the aim of promoting stems with valuable knot-free timber, outside a knotty core of no more than 15 cm diameter. It is only worth pruning potentially high quality trees. Walnut - prune in July and August, to avoid excessive bleeding from pruning wounds. Cherry - prune in July and August, to minimise risks of infection by bacterial canker and other diseases. Do not prune any species during periods of very low temperatures or severe drought. To maximise the benefits of pruning, branches should be removed before the stem is 15 cm in diameter. This typically occurs between the ages of 15 to 30 in most broadleaves. 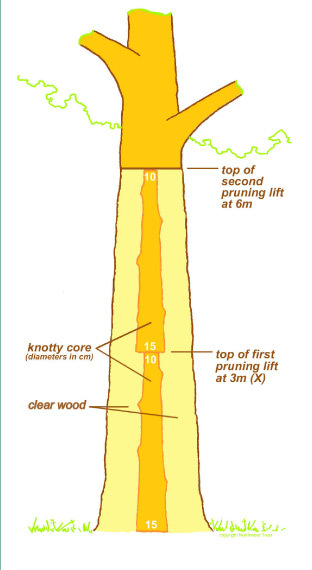 Branches should be removed from the base, upwards to the point on the stem where the diameter is 10 cm (the top of the first pruning lift in Figure 1), usually over a height of about 3 m. A few years later, when the diameter at the upper pruning level has grown to 15 cm, a second lift can be undertaken, raising the pruned level to about 6 m. It is physically very difficult to prune above 6m. Pruning should remove no more than one third of the live crown at each lift. If more is removed, diameter and height growth will be slowed. Lower side branches should be removed progressively, from the bottom upwards, in two or three lifts over a period of years, normally up to a maximum height of 6 m from the ground. Branches with diameters over 5 cm where they join the stem do not generally heal in time to produce clear logs. Larger branches that contain heartwood should not be pruned, as they may become infected and result in decay. How many trees should be pruned? Costs will be repaid if the number of trees pruned does not exceed 150-200 per hectare, or about double the number that will be in the final harvest. The rest will be removed in thinnings before they grow to large sizes. When a live branch is removed, a wound is created on the stem of the tree. As trees cannot repair damaged tissue, wounds are walled off, or compartmentalised. Good practice involves retaining the branchbark ridge (Figure 3) that will maximise the tree’s ability to achieve this compartmentalisation. Figure 2 : Poor pruning techniques: flush cut (left), branch stub (right). Do not use flush cuts (Figure 2). Cutting too close to the main trunk causes an excessively large wound and removes the natural tissues and mechanism that promote healing. Do not leave branch stubs. These will have to decay and fall off, or the diameter of the trunk will have to increase sufficiently to cover the stub (Figure 2). Always cut as closely as possible to the outer edge of the branch-bark ridge, but do not cut into or behind the ridge or into the branch collar (Figure 3). Pruning dead branches also requires care to reduce the risk of injury and promote fast healing. Do not cut into the living callus collar that forms around the base of a dead branch (Figure 3). Do not risk tearing the bark below the cut when removing larger branches. Remove most of the branch weight by using an under cut followed by a top cut, and then remove the stub (Figure 4). Do not use wound dressings to cover pruning cuts. They are ineffective and may even hinder the healing process. Tools recommended for pruning include various types of secateurs, loppers and special handsaws (Figure 5). To remove branches more than about 2m from the ground, a pole saw or ladder will be required. All tools should be kept very sharp. Health and safety guidelines must be followed when pruning. Other educational leaflets are available on request covering Establishment of Broadleaves and Formative techniques, please email enquiries@woodlandheritage.org.uk for more information.